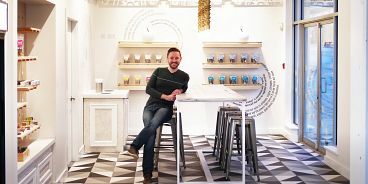 If you’re a cold-pressed juice loving health nut, you’ll be thrilled to learn that a second Krokodile Pear location has recently popped up in Yaletown near the corner of Davie and Richards. Surrounded by plenty of parking, it’s a perfect stop for grab-and-go green juices, nut mylks and lots more. Another perk of Krokodile Pear is that they open at 7:30am, so if your day needs a nutritious kickstart, substitute your regular latte for a green juice sweetened with nothing but a touch of apple. Or feel the burn with Krokodile Pear’s new green made with cold-pressed jalapeno juice. Salads are also available at the new Krokodile Pear. They’re sourced from a brand new local company called Nourish Vancouver. This husband and wife team prepares hearty, organic salads (and more) — many of which are vegetarian or vegan — with the option of adding an organic, locally sourced protein (although those you’ll find at Krokodile Pear are veg).